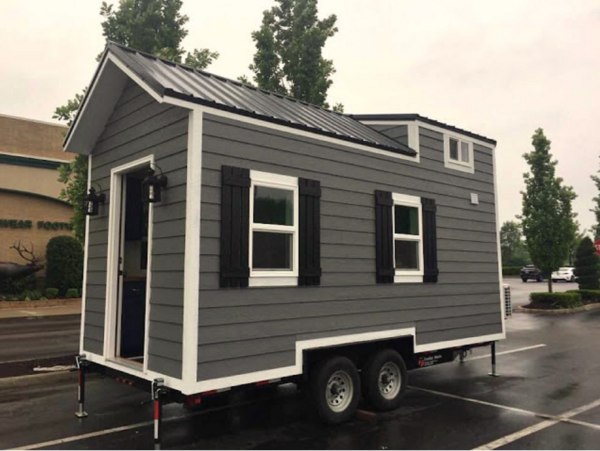 This is the Brookside by Blue Elk Tiny Homes in Kentucky that’s currently for sale. The little home comes with metal roofing and pretty slate grey siding, and packs in a kitchen, living room, bathroom and queen-sized loft bedroom. I like that this build can be used on or off-grid, depending on your current and future parking situation! Be sure to take the newsroom video tour on the last page to get a better idea for the space. Get all the details, price and builder contact information on the last page. Enjoy! These beautiful black shutters really complement the grey and white. The tee-tiny kitchen fits in the essentials! Here’s the living room bench with extra storage underneath. Sliding door leads to the bathroom and the ladder to the loft. This cat picture is cracking me up! What a perfect pillow to describe tiny living! The Nature’s Head composting toilet in the bathroom. I like this towel rack built into the wall. What a fun-shaped sink! I’ve never seen one like this before. It’s ready to go to it’s new owners. Maybe that’s you! All the seller’s details are right below this picture. I like this build very much; even the way the exterior is painted; very classy. The only thing I don’t like is when you (or a guest) come into the house, if the bathroom door isn’t closed, your line of sight takes you straight to the head. Don’t like this at all. Better to see a colorful shower curtain or a pebble glass shower door than the head. It’s a real turn-off. But other than this… I could very easily live here. exactly! silver! not only that, i wonder at the western mind set to keep the toilet and the bath sharing the same space – it’s so 20th century … the ‘head’ should be in a private, ventilated tiny room with a mini sink (if composting) and a door not accessible from the “bath” room, which is a wet room with a central grey water drain and a tub, for bathing if one is so inclined and hooked up to water. the only thing a toilet and “bath/shower” should share is a wall! period. So while I personally don’t disagree that a toilet should preferably be separate but it’s not something that is always possible in a small space… and I know not everyone likes to have split bathrooms and so there will be people who will disagree with us. Among other reasons… But it doesn’t have to be a detached structure and you can make it an extension of the main house… This is often done, for example, with Yurts and other small structures where it’s hard to have a separate private space. I love the bench idea, James D. In fact, I think the box-bench should be permanently built in. This would go a long way to reforming this aversion. I, too, would have preferred a pocket door. I’m not a fan of these cow barn doors; just personal preference. As for outside the house, this probably wouldn’t hold much of an appeal for the women who would have to leave the house, in all kinds of weather, at night by themselves; not a particularly safe solution in these times. I think the box idea is probably the most practical and be best for general consumption unless a specific owner wanted something different. I like it, but that bench seat does not look comfortable at all. Well two things I don’t like about this house. 1. The toilet. I would have a RV low flush instead. 2. The instant hot water heater above the sink. It could have been put either behind toilet or where the towel rack is. Maria, most builders can add whichever toilet you’d like 🙂 RV low flush are still common choices. Very pricey for such a small home. I’ve had a chance to personally stop and check this out. Its nice. Just cant see 48 grand nice!